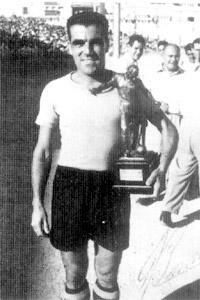 Guzi Bonnici with the MFA Footballer of the Year trophy he won in season 1956-57. Those of you who remember the 50s and 60s will surely recall the name of Guzi Bonnici, Sliema's full-back, one of three brothers who played for the club. The others were his twin Michael and their younger brother Salvu. The Bonnici brothers learned their football at the Salesian Boys Brigade. This association was responsible in those days for the introduction of many future Sliema footballers. Guzi and Michael trained under Ninu Calleja, the Malta, Naxxar Lions and Sliema forward. They also took part in the youth league organised by the Salesians and in 1946-47, and had their first taste of competitive football when playing for the Salesians in the Anglo Maltese Football League. This competition was organised in the 40s by 'Meme' Scicluna of the Empire Stadium. In 1948-49, the twins joined the Wanderers. Under the guidance of Sliema's player-coach Jimmy McCormick, they made great strides. McCormick promoted them to the second team and it was here that the careers of the two youngsters began to drift apart. Guzi deputised for Eddie Cole in several friendly matches and thus began to attract more attention than his twin brother. Born in 1931, Guzi developed into one of the outstanding personalities of his era. However, when he first appeared on the scene, he was still raw. He tended to whack the ball all over the place, mainly in the direction he was looking at. Guzi could hardly be described as a constructive player then. However, Guzi soon made his critics eat their words. Before long, he developed into a bustling defender, excelling in first-time tackling and speed on the ball. He also had a natural knack for covering up when under pressure and an excellent sense of positional play. He was cool, calm and collected. McCormick tried Bonnici in the right-back position and he passed his test with distinction. Guzi made his debut for the Wanderers in Tripoli in January 1951 in the 3-1 victory over the Pick Army. He kept his place for the game against Associazione Italiana and for the 2-1 victory against Ittihad. Bonnici made his league debut at centre-half on January 13, 1952 in the 1-1 draw against Rabat, taking the place of Tony Nicholl who was injured. The ageing maestro returned to the team for the game against Floriana. Bonnici, however, was not dropped from the team but moved to right-back, a position he kept up to the end of his career. Bonnici, at first, found it difficult to retain his place in the Wanderers' team. In his first two seasons he only managed nine league appearances but he made up for that by winning his first two FA Trophy winners' medals. In 1953-54 he won his first championship and the first of a record six Scicluna Cup medals. By the end of his career he had collected no fewer than 17 major honours. Season 1955-56 was a glorious one for the Wanderers. They won the quadruple crown - the League Championship, FA Trophy, Cassar Cup and Scicluna Cup. Guzi, together with his brother Salvu, was the heart and soul of a formidable defence which also included Tony Nicholl, Ray Cosby and Lolly Cuschieri. 1956-57 was another great season for the Malta and Sliema Wanderers right-back. After winning the league, the Cassar Cup and the Scicluna Cup, Bonnici was awarded the Footballer of the Year trophy as the most outstanding player of the season. During that season, Guzi won his first of six international caps for Malta in the friendly match against Austria. His last international was against Norway on July 3, 1962. The late 50s and early 60s were an anti-climax for the Wanderers. This period belonged to Valletta and to a certain extent Hibernians. There was, however, no lull in the career of Bonnici. He was still Malta's number one full-back but injuries were now beginning to plague his game. Midway through 1962-63, he suffered a serious injury and missed the rest of the season. The next year Bonnici tried to make a comeback, playing in the unusual position of half-back in the Cup Winners' Cup encounter against Borough United at the Race Course Ground, Wrexham. It seemed at the time that he had fully recovered but against St George's in the league he suffered a recurrence of his old injury and was forced to retire. He died in 2002, leaving behind him many fond memories of a fine full-back and a solid, fearless defender.